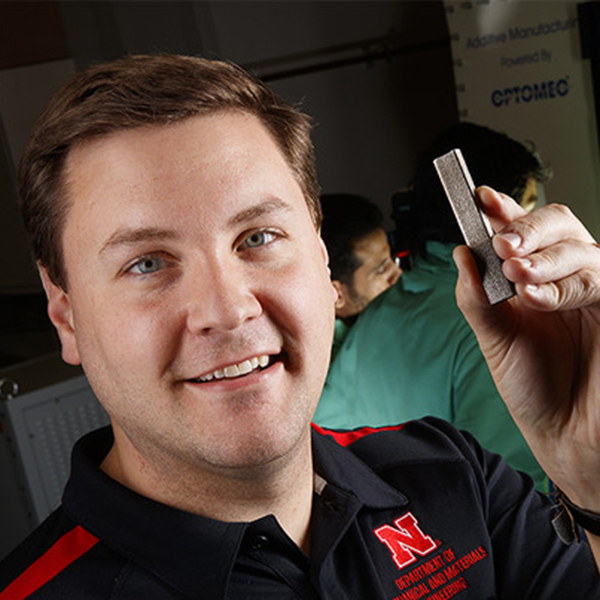 Michael Sealy, assistant professor of mechanical and materials engineering, holds a basic example of the medical implants he's designing via the University of Nebraska-Lincoln's 3D printers. Sealy is using the printers to build magnesium-based screws, pins and other implants that can slowly dissolve in the body, which would negate the need for follow-up surgeries to remove such implants. Michael Sealy, assistant professor of mechanical and materials engineering, is using cutting-edge 3D printers to build implants that can slowly dissolve in the body, which would negate the need for follow-up surgeries to remove such implants.